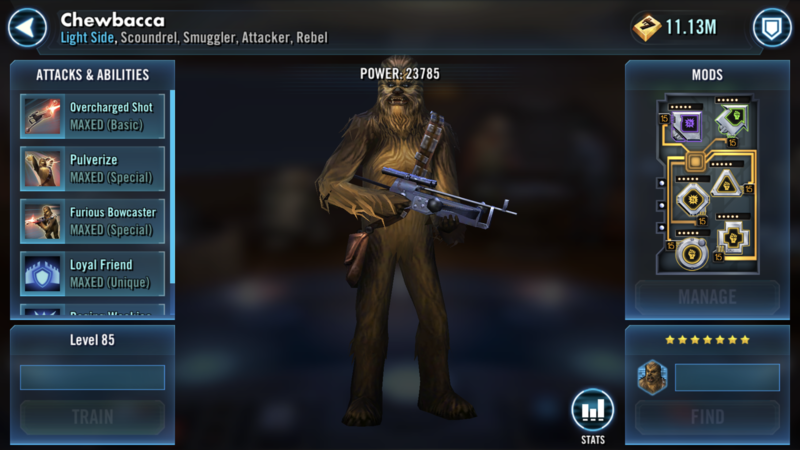 Have you unlocked Chewbacca and looking to share your vast knowledge of this Rebel hero with the community? Are you a newer player who would like to borrow a really strong Chewbacca to use on the Light Side, Cantina, Mod Battle or challenge holo-tables? Are you an older player who did not unlock Chewbacca but want to test him out? Here, veteran players with Chewbacca can post their ally codes, allowing players who do not have Chewbacca to become allies with them and borrow him! > Post your ally code if your willing to share your Chewbacca with the community! What do u mean by lead set? The character(s) that will be shared with Allies will be whichever you set in the Leader slot for your squad. You will have formed 3 squads, one for each: Cantina battles, Light side nodes, and Dark side nodes. If an Ally is selecting a squad to battle in Cantina, they will have an option to choose the Character that you set as Leader when you battled Cantina to assist them. If they are in Light side battles, they may pick your Light Leader. Etc. How does one set a toon as their ally? "When life gives you lemons, throw them at someone"
The last character used as leader on each table is set so allies can borrow them. EDIT: Ally list full. Sorry. 7* G12 both zetas. Cantina and Light Side. Have chewbacca, not very high.